The DJControl Inpulse 300 is a two-channel device that is Hercules’ largest and most full-featured controller to date. 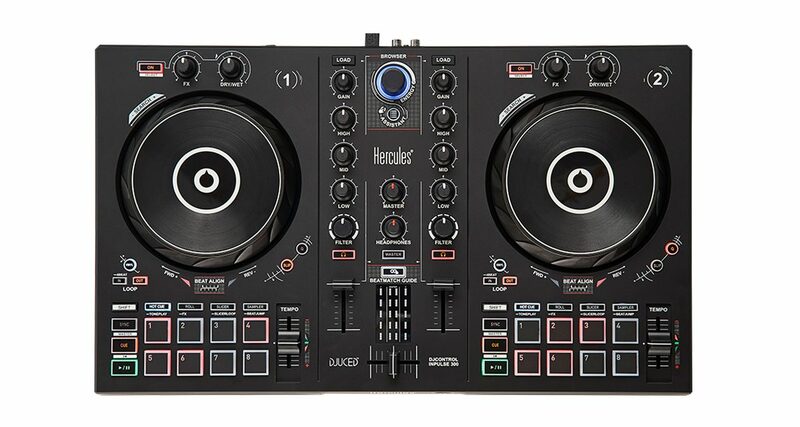 It looks the business and is well-priced for beginner DJs who want to get serious. The Beatmatch Guide feature and Intelligent Music Assitant are nice touches, the jogwheels are responsive and the onboard performance pad modes will keep DJs busy during performances. This is the best controller Hercules has made yet, though a better build and higher quality components would’ve made this a five-star review. 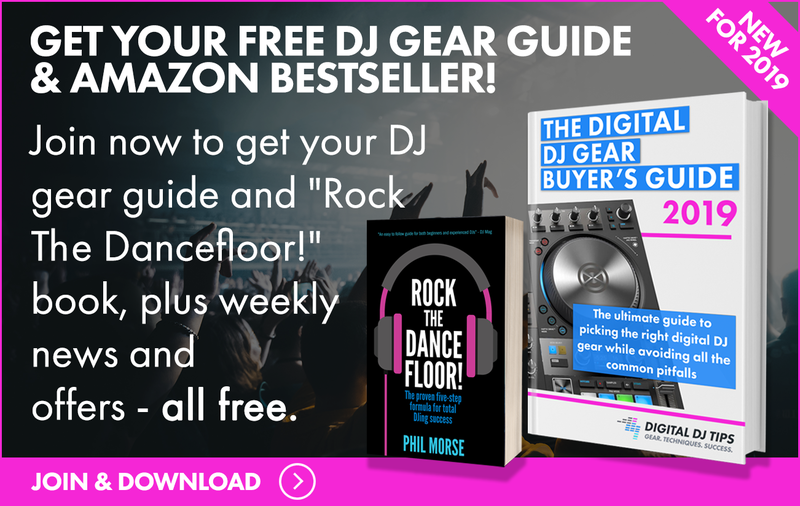 Highly recommended for new DJs. Hercules is known for its accessible, budget-friendly and fun controllers – they’re well-loved by beginners and we’ve used them a lot in our digital DJing journey. We were pleasantly surprised then when the company introduced a new range of controllers known as the Inpulse series: made up of the Inpulse 200 and Inpulse 300, they are more somber and conventional-looking DJ controllers (at least as far as today’s digital DJing gear go) that look more in-step with Pioneer DJ’s sleek, minimal look as compared to Hercules’ more adventurous designs (see the Hercules DJControl Universal, DJControl P32 and DJControl JogVision for a taste). It’s still “Herculean” though: on the Inpulse 300 you’ve got indicator lights beneath the jogwheels and beside the pitch faders. These are for the “Beatmatch Guide” feature that tells you if you need to speed up or slow down a deck while you’re beatmatching, which can be useful for beginners getting to grips with manual beatmatching. You’ve also got controls on here to access the Intelligent Music Assistant and Energy features which are found in the included DJUCED software: Assistant gives you song suggestions while Energy allows you to view songs that are colour-coded according to their dancefloor energy (more on that later). The Inpulse 300 is a two-channel device with touch-sensitive jogwheels, eight performance pads per deck with eight modes, looping controls, slip and quantise buttons, and three-band EQs with filters and gain knobs per channel. Each channel has an FX knob and a Dry/Wet knob plus an FX on/off button. It’s got a Browse knob along with the Assistant access button at the top of the unit, plus master and headphone knobs. The Beatmatch Guide can be toggled on or off via a button in the centre of the unit where it’s flanked by short-throw volume faders and a crossfader. The front of the unit has an 1/8” headphone jack, and the rear has RCA master outputs, a socket for an undisclosed “Hercules Add-On”, and a USB jack for connecting your laptop. The Inpulse 300 ships with a braided USB cable – a nice touch considering almost all DJ controllers come with a generic plastic cable. You’ll have to supply your own RCA cables to connect the master outputs to your speakers though. The jogwheels of the Inpulse 300 are made of plastic but feel solid. They’re stiffer than what you’d find on most controllers from Pioneer DJ or Denon DJ, and that’s not a bad thing – I like them because it feels like I can get really rough with them without over-correcting when I line up the beats (and they also don’t feel like they’re going to fall off). They are responsive and are touch-sensitive. Both jogwheels have a Vinyl button similar to what you’d find on Pioneer DJ gear that lets you toggle from using the top of the jogwheel for scratching and cueing (Vinyl mode) or for pitch bending. Of course, you can do your pitch bending using the edge of the jogwheel regardless if you have Vinyl mode on or off. The pitch faders on the Inpulse 300 are short-throw as well, making it just a bit tougher to zero-in on a specific BPM, but it’s not a total dealbreaker. It also doesn’t have a centre detent, meaning you won’t feel the fader settle into a groove when it’s at 0% – you’re going to have to look at the green light beside the tempo fader to know for certain. There are eight performance pads per deck on the Inpulse 300 – that’s the most pads ever found on a jogwheel-equipped Hercules controller. The pads are rubbery and stiff, though they still act as buttons, meaning you have to click them in order to register a pad press. That means these aren’t velocity-sensitive pads like the ones you’d find on more expensive DJ controllers or drum pads – again, not a dealbreaker considering this is a beginner controller. There are eight performance pad modes onboard: Hot Cue, Roll, Slicer, Sampler, Toneplay, FX, Slicer Loop and Beatjump. Toneplay lets you pitch up or pitch down a cue point that’s great for melodic cue juggling, and FX works as a pad FX mode for greater effect manipulation while you spin. The Beatmatch Guide is a system that consists of a pair of lights below each jogwheel and beside each tempo fader. Here’s how it works: Let’s say you’ve got a track playing in a deck and you load a new track in the other one. If you need to speed up or slow down the new track in order to match its tempo with the one that’s currently playing, you’ll find the corresponding Beatmatch Guide light line up – it’ll point up if you need to slow down the deck, or down if you need to speed it up. Once you’ve done your tempo matching, you need to line up the beats. This is where the Beatmatch Guide’s Beat Align lights help you: if you need to nudge the track forwards, the arrow pointing to the left will light up. If you need to nudge it backwards (slower), the arrow pointing to the right will light up. It’s easy to follow and is useful for new DJs who still haven’t got a good handle on tempo and beatmatching. Once manual beatmixing becomes second-nature later on, you can then turn off the Beatmatch Guide just by pressing the on/off button. The Inpulse 300 works with the latest version of DJUCED software, which includes the new Intelligent Music Assistant feature. The Assistant is able to give you song suggestions based on what you’re currently playing and what’s in your DJUCED library. It also lists songs that are experiencing heavy rotation and are being played by other DJs around the world, and it can sort and arrange your tunes according to energy level. These are all helpful for both new and intermediate DJs who still haven’t dabbled with software-powered song selection because they’re easy to use and are implemented well in DJUCED. The Inpulse 300 is the most feature-packed and professional-looking controller Hercules has put out, but it still continues the company’s tradition of accessibility and being beginner-friendly thanks to the addition of the Beatmatch Guide and Assistant features. There are very few controllers with this level of functionality that still has novice DJs in mind – even the entry-level Pioneer DJ DDJ-400 doesn’t have beat matchguides, for instance. At just under US$200 this is also one of the most affordable “serious” beginner controllers that’s got pro features onboard, plus it comes with DJUCED software to get you started straight away. It’s also got Virtual DJ compatibility forthcoming so you also have the option to use that as your DJ software should you prefer that over DJUCED. Overall, the Inpulse 300 is Hercules’ best DJ controller to date, and it’s a brave new and mature direction for its DJControl line of beginner controllers. Highly recommended for new DJs. Well, in my opinion. On plus for Impulse 300 is a non-mirror layout, 3-band EQ and Gain knobs. The Assistant and Beatmatch Guide are cool features for begginers. The pitch faders are too small, but that’s normal in low budget controllers. All in all it’s look quite nice. Some new toys from hercules. in three sizes and prices no less. I saw on the VirtualDJ Controllers listing page that these new units are “coming soon” so should see support shortly.